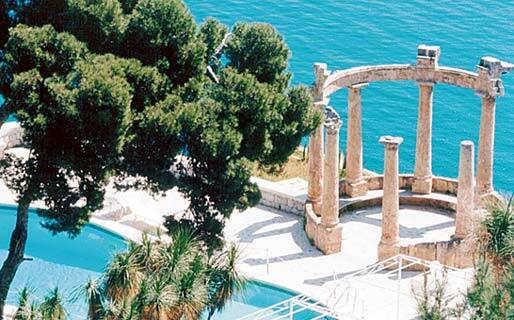 The Grand Hotel Villa Igiea is portal to far away lands in a distant time. Designed in 1908 by the grand master of Liberty architecture Ernesto Basile, the structure emulates the cultural prowess of the European Palermo. Built around an existing edifice of the 1400s owned by the Englishman Downviller, Villa Igiea is a magical combination of Renaissance balance and Libertarian luxury. 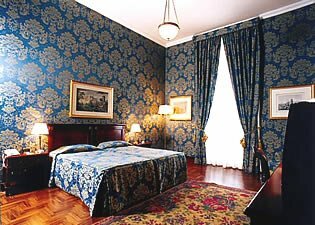 True to its origins, Villa Igiea is furbished with 1898 Liberty pieces designed and built by the same Basile. The mind has preconceptions of how things should be. Exotic destinations with Palm trees slowly swaying to and fro, a hint of spices carried on a warm breeze, deep and profound colors accentuated by sun beaming through the clear deep blue sky, deafening silence penetrated by the cries of the gulls as they feed in the early morning, and drone of waves secretly lapping on the rocks of the shore. 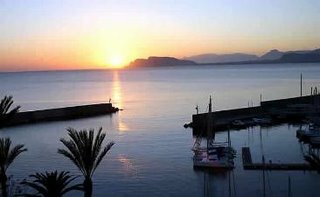 As we gaze over the sea from the patio outside our room it is difficult to believe that we are just minutes away from Palermo instead of some Polynesian island. 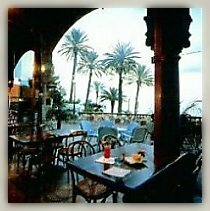 A knock on the door brings us back to reality as our waiter rolls the breakfast cart onto the balcony and discreetly disappears. We had arrived late last night and our first meeting was not until lunch so we settled back into our fantasy. Café and hot milk, freshly squeezed orange juice, several Mafalda and other breads still warm from the baker and fresh jams were spread over the service table. The sun, rising in the morning sky, warming our bodies, is just bright enough to merit sunglasses. A weekend in this paradise gives a whole new meaning to a business trip. 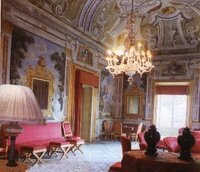 Lunch with Luca Orlando at Villa Niscemi, a 17th century palace purchased by the city of Palermo, the afternoon at the historical Universita’ degli Studi di Palermo, and a marvelous fish dinner at the contemporary restaurant La Scuderia with our fantastic employees. That evening we slept with the air conditioning off and the double French doors wide open. The soothing melody of the waves and the salty sea breeze quickly put us into a deep and refreshing sleep. Again we find ourselves daydreaming, imagining being lost on a far away island and the knock at the door. Breakfast, little changed from yesterday, the warm bread, fresh squeezed orange and grapefruit juice, homemade jams and a lovely pot of Espresso with warm frothed milk. As the most gentile waiter slid out of the room we knew that this was our weekend. The important people had returned to Rome last night before dinner, I advised the hotel staff that unless Rome was burning to the ground, no calls were to be passed through and I had disconnected the cell phones. Not just turned off, I had taken the batteries out just in case they magically turned themselves on. We decided to stroll through this beautiful and historic building. The corridors of polished granite were wide enough to drive a truck through. Separated from other common areas by granite pillars supporting the upper level verandas overlooking the main floor. 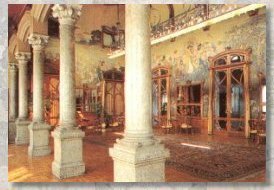 Incredible works of art adorn every wall and Epic furniture strategically placed unclear if they were the focal point or a compliment to the impressive architecture and workmanship. 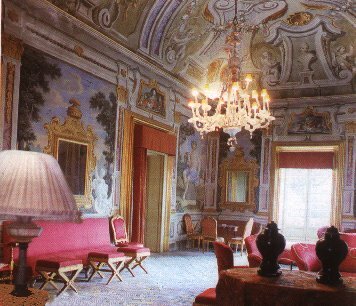 Our morning passed quickly and lunch in the sumptuous dining room known as Sala Specchi. We enjoyed delicately roasted fish with just a splash of lemon and a surprisingly fresh local white wine. We returned to our room after this light but exquisite lunch and decided to take coffee under the palm trees on the patio of our room. Our coffee moment became an early afternoon nap as we were overcome by the tranquility. The sounds from the pool slowly brought us back to the land of the conscious. The deep blue and bright turquoise colors of the sea beckoned. Bathing suits donned in record time we moved to the low cliffs next to the sandy beach. A small ladder appeared through a natural passageway in the rocks. 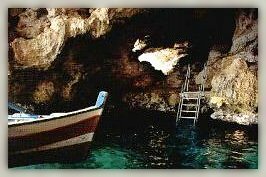 Raffaella climbed down the four or five steps to the water and dipped her toes. Perhaps the sun had raised our body temperature or the depth of the small pool next to the cliff was particularly deep but the water was cold. Sissy that I am, not wanting the slow and agonizing inching into the water I jumped, drenching Raffaella as I entered the water. A shrill scream penetrated the air as she dove in after me sure to make me pay for the cold shower. The water was cool but tremendously refreshing. This was the perfect way to wake up on a joyously sleepy afternoon. We swam awhile in this secluded portion of the beach. The water clear and deep, we could see the fish swimming beneath us just over the rocky bottom. Within a few hours our strength had been consumed and it was time to move on. A quick shower and a change into slacks, shirt and dinner jacket and we were ready for the evening. Villa Igiea has a strategically placed bar-lounge next to the pool. The sun is slowly setting in the evening sky and a red-orange trail leads across the surface of the water to the horizon. A light, cool breeze blows in from the northwest across the water bringing with it scents of the ocean. The taller Palm trees sway ever so gently and slowly as the days heat subsides to the cooler air of the early evening. Prosecco is our poison as we chat with new friends from London and Sydney. We exchange thoughts of this beautiful place and others we have seen during our travels but we all agree that Villa Igiea is one of the most pleasant places we have ever visited. It's always a pleasure to read your recomandations in all it's details and well documented. 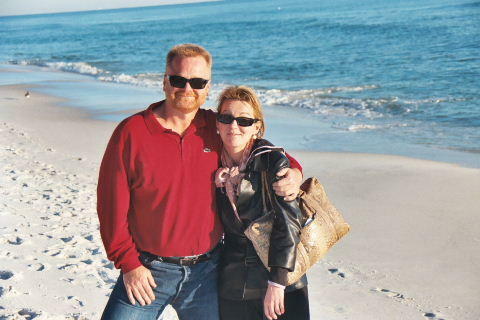 Renny - This is a gem of a place. Very few people actually know about it yet it is considered one of the top 10 on the Med. Sea. Check it out, September is a great period to see Palermo. Sounds like it combines all the good things in a holiday. Including the waters of the Med! "Prosecco is our poison", now that's positively perfect product placement positioning! That hotel was not far from the family palazzo on Via Roma and i remember my nonna talking about it. ChickyBabe This is an opportunity for relax, sun, fun, passion, great food and wine. Quality over Quantity, and you can enjoy this one late into October. You should give it a try. WOW!!!! I wanna go there!!! I love the Italian buildings circa 1400's, just so beautiful (except that damp problem) it looks like paradise on the Mediterranean. Jerine It is beautiful, exotic and peaceful. You can easily lose yourself at this hotel and seriously question your desire to return home. Natalie I understand what you are saying about the architecture and workmanship. I get a "comfortable" feeling when I am in a building that has been around for a couple of hundred years and is in perfect shape.